As standard we hand paint our garages in a choice of 6 colours from the Cuprinol ultimate garden wood preserver range, however if you prefer to have your garage pressure treated we can offer this too. The tanalising treatment protects the wood from rot and insect attack, it does not however have any waterproofing qualities. 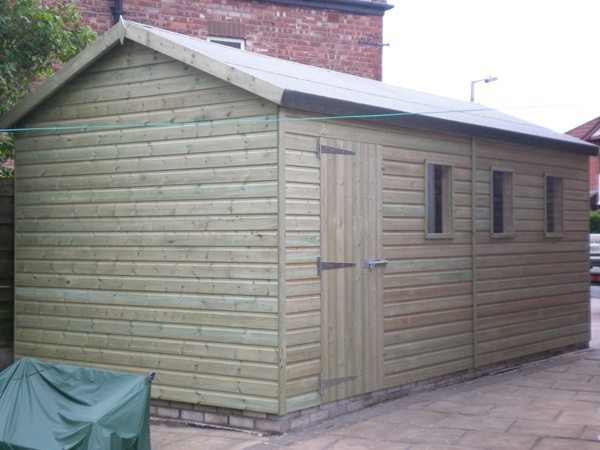 We therefore recommend treating any tanalised treated external wood with a water repellent. Tanalised treated timber is totally immersed in the liquid treatment and is therefore very wet. Because of this tanalised shiplap cladding has a lot more shrinkage between the boards than standard kiln dried shiplap which has been surface treated.